Journalist Geoff Williams spoke with a entrepreneurs, psychologists, wealth managers–and me–last week about when (and how) parents should stop giving their children money. His logic in wanting to speak with me was straightforward: Old Money families obviously know something about how to handle this issue, or there wouldn’t be any money left. He had some great questions, and I had some suitable answers. The result is Geoff’s well-written and well-researched article that I am happy to have made a small contribution to. You can find it HERE. I’d love to hear your comments about this important subject, both the philosophy of it and your experiences with it as a child and a parent. As a child…What worked? What didn’t? Were you given chores? An allowance? A trust fund? As a parent…What worked? What didn’t? Did you require chores? Do you give an allowance? Did you establish a trust fund? This is one of the key issues parents and children deal with in life. I’d like to hear as many opinions as possible. So enjoy the article, and feel free to share. Thank you for sharing this article Byron! I don’t have children yet. If I do, they will be raised like I was. Conservatively. My parents always instilled in me a sense of humbleness with finances. As a child, my financial needs were met. My wants were met in moderation. I had to save up my allowance from chores to purchase my wants. This taught me the value of my labor. For instance, my first job was at 16. I understood the value of hard work and the notion of saving for a rainy day. Living below my means is important today as I live a minimalist lifestyle. My education was purchased by my parents. It came with the understanding that college is for learning not for partying. College, unlike some of my peers, was a place to learn career skills. To be able to provide for myself in later years. My first career internship started when I was a Jr. in college. So, I used my college experience as a career driven pursuit, not for partying. As far as deciding to pay for a child’s education. I believe education should be expected of a child. However, it’s important to not sink money into a child who intends to use college as an underage drinking venture. This style of child-rearing is beneficial because it teaches children that despite privilege, they are still required to make a meaningful contribution to society. I value giving back to society. Hence, why I am involved in many charitable pursuits. I value furthering society more than purchasing a designer bag that will just hang in my closet after a few uses. This article is so crucial for my generation. The ‘Instagram Generation’ in particular. Flashes of wealth are commonly shown on these sites and it distorts reality. It takes books like Byron Tully’s, parents with their head on straight to guide future generations in the correct direction. Always great to hear your ideas Byron. Have a great week everyone! My childhood was founded on old school WASP austerity. You didn’t talk about money it was just there. I got a small allowance weekly for doing chores, and if I wanted anything else I had to get a job. Trust me you learn the value of a dollar working at a movie theatre at 16. The family money however did not belong to any person individually, it was there for everyone and no one. We had good inherited furniture, education was paid for, and I had a happy childhood, but I never got the obsession with counting other people’s money that my classmates did. Once while a few G and Ts in with my parents, they made clear to let us know nothing went to us until we were in our thirties per the trust guidelines, it’s been that way since the 1800s. We were always mildly aware of that old fear of “what if the dosh runs out”, so everyone worked for a living and I couldn’t imagine doing it any other way. When I get married soon, and have my own children, they’ll be raised in a similar fashion. They’ll receive their portion as we all did at an appropriate time, or as my mother put it “the age when you generally stop doing stupid things with money”. I still haven’t hit the age when I can draw some it needed, but honestly I don’t even know if I would need to. That’s what I hope to teach my children, that money is a tool not an end game. It’s how my mother was raised, how I was raised, and hopefully how my kids will be raised. My grandfather used to give me five dollars a week every week without fail. There was no expectation to do chores but an expectation to be wellbehaved and study/do homework. This was vital in my relationship with money because it taught me the value of savings. I understood that regular and consistent earnings over time can make large sums in a relatively short period of time. 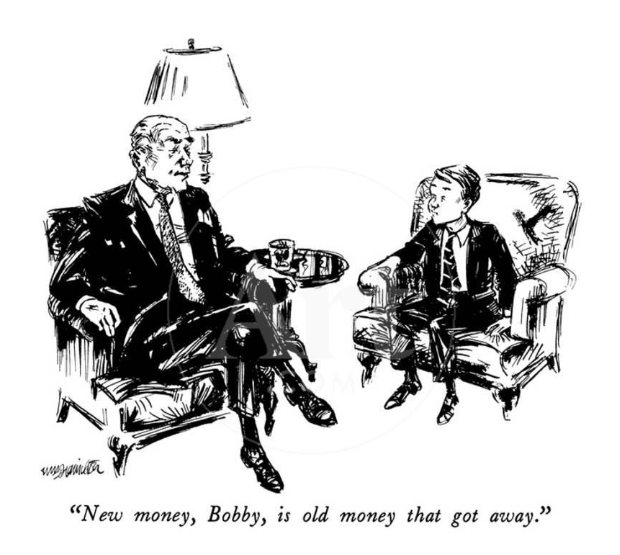 As a young boy I learned early on that frugality could make one wealthy over a long period of time. This was before I learned about compound interest. Lessons are well learned and habits well established. For my own children I will do something similar but will likely establish a record keeping of $25 in a fictions bank account earning 5% each month in addition to some nominal allowance each week. Expectations will be to study/do homework/practice a musical instrument/etc. Then, they can give me the allowance back and I will credit their account with the money along with 5% each month. Once the balance gets too large the goal of teaching savings likely well learned and I will lower the interest to 3% each month. Children need to see compound interest over a short time to keep the inspiration. A month to a kid is a year to an adult. Best age to start is 9 or 10. My parents paid for university (Bachelor’s and Masters’), and I lived at home for the former and had an allowance and living expenses for the latter. I worked during the summers as a babysitter which covered my clothing. My first job was in London, living on a pittance, and every now and then my mother would let me use my “emergency” credit card to get something nice for myself at Gap (this was the nineties and Gap was cool in Europe!). As soon as I was earning a solid income, I was on my own. I did live at home at one point while working but was expected to pay some rent to contribute to household costs. I also had the use of my mother’s car every now and then but was expected to pay for petrol. In Europe in the nineties, it was not considered normal to get hair/nails/pedicures done if you were a student. Students lived frugally, regardless of origin or pedigree. When I was established and had a really good income and was considering buying a house, my parents contributed towards my down payment. More recently, my in-laws contributed to our moving costs. These were one-time gifts that were greatly appreciated but very unexpected. I agree with your comments in the article Byron. If you are to withdraw an allowance or support, it is good to communicate early on and make sure that the children have been raised to understand the importance of financial independence. I feel very fortunate that I did not have to work during college terms and could focus on my studies. There was no such thing as student loans at the time, so we did not have to contend with going into debt to cover living expenses. It was a much more level playing field than today. The only slight difference between some students with money was Ralph Lauren button-downs instead of shirts without logos from the local high street. As a 55 year old with a 10 year I can tell you because of medicine and vaccinations kids are a lot healthier now than the 60’s. Mumps, measles, chicken pox and whooping cough just are not a reality (thankfully). From that perspective the good old days were not so good. * Homework was important but not over emphasized, since a lot of kids didn’t go to college because jobs were plentiful with a high school degree. * Wanted a new train set. Not an issue, started delivering papers. * At 16 was expected to get a part time job. Half my check needed to be put in the bank. * Had to go to College in a very methodic fashion. 2 years of community, then transferred to a 4 year school with a coop program. When I had a job went for a Masters at night. Pretty much raised my son the same way by curating the best of all generations with a strong emphasis on reading. The devices are controlled. No cable TV but we do have internet for school and remote access to our jobs. I did set up a trust fund for my son as well as a college fund. *My parents received a toaster in 1949 as a wedding gift. I was using it until recently. I hate replacing thing that are well made. So I called my 100 year Aunt and asked her “Do you remember that toaster my parents were given … do where it came from?” My wife and Aunt broke out in laugher. FYI there is a store called the Vermont Country store that makes it easier when it comes to purchasing items like toasters and dishes. Do you know the expression “beware the third generation”? I first heard it several years ago on some forgotten episode of something from a BBC production, probably released on Masterpiece on PBS. The gist of it was, the first generation builds a business from scratch and becomes successful, leaving a thriving concern to the second generation. The second generation, having lived through the hardships is suitably impressed and continues to build the business. But not wanting to put their children through the same hardships, spoils the third generation. The third generation inherit the business, but knowing nothing of hard work, and used to having their every wish fulfilled, ruin the business. Bob, I can vouch for the Vermont Country Store. I live in Vermont and have been there several times. It’s somewhat of a tourist attraction, but they have so much stuff from way back when. It’s fun to just go walk around and say “hey, I remember these!” I don’t recall seeing a toaster though, but I’m sure there’s a supply of them. Thats where I purchased my Toaster from. My Aunt suggested the store and sent me a catalog. I’d say that it’s not only how much one gives or gets, but the education that goes along with it. Many were raised modestly, only to become conspicuous consumers who spend more than they can afford.